Unless specified (or sold in spools), line is sold by the foot. Anchoring: Normally anchor rode (the rope between your boat and anchor) is made from stretchy 3-strand or braided nylon. This will absorb a huge amount of shock that otherwise would expose your boat's hardware to damage. Dinghy Braid: Low cost, simple polyester line with a diamond pattern on the jacket. This pattern provides a little extra friction when pulling small diameter lines by hand; useful for dinghies and small boats without winches. Dock & Mooring Lines: These lines are usually made from stretchy nylon, there are polyester options available with shock absorbers built in - or snubbers can be used. Available in several colours. While nylon has more elasticity, polyester provides excellent durability and strength. Mooring lines should have stainless steel eyelets installed on the ends. Fender Lines: Usually made from nylon, but often available in polyester, strength isn't an issue, but look for nice, comfortable, large diameters in dynamic colours. Hi-Brite Spools: These spools are sold in bulk lengths, usually 100 feet or more, in various materials, but normally high strength polyester or hi-tech Spectra cores. These spools are small diameters, ideal for racing dinghy applications. High-Tech Rope: High-tech ropes are designated as such because their core strength is significantly higher than the strength of polyester. Spectra and Dyneema are essentially the same product; Ultra high molecular weight polyethylene, with different brand names. They offer strength-to-weight ratios similar to steel. Of course, they cost more, but in many applications, such as replacing wire halyards or lifelines, the savins in weight and simplicity is highly worth it. Lightweight Floating Rope: When rope floats, it is because it has not absorbed water. Therefore, these ropes are 100% synthetic and lightweight. Ideal for towing lines, heaving line, or other applications which require flotation. However, the strength of these ropes are not as high as polyester (usually having a polypropylene core), and often as suspectible to sun damage. Technological advancements are allowing these ropes to become stronger and more durable, but currently they are intended for floating applications only. Manila Rope: Unless you're sailing a turn-of-the-century barque, you should not choose manila rope for any application other than strictly decorative. However, manila rope can provide stunning nautical effects! Polyester Yacht Braid: This type of line will meet most of your needs! Excellent durability and strength, moderate cost (marginally more than nylon) with low stretch and available in various colours. When in doubt, go with polyester. Wire to Rope Halyards: These lines have a portion of stainless steel wire, spliced directly to polyester rope. This line is meant to replace existing wire-to-rope halyards. Do not install a wire-rope halyard on a boat that currently has an all-rope halyard - the wire will destroy the sheaves intended for rope! The following information may help you decide the right size of line to purchase. It can also be helpful determining the load placed on other hardware on your boat, such as shackles, blocks, padeyes and eye straps. The breaking strength of rope is based on direct pull along a single length of rope. When slings, using two or more legs to carry the load are properly employed, the rope's safe working load is substantially increased. 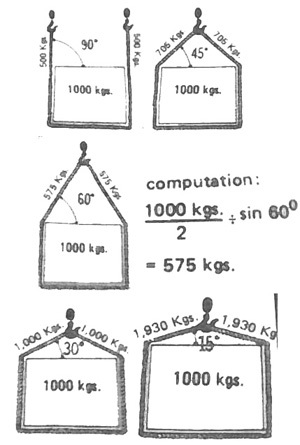 However, as illustrated below, the load factor on each kilogram of the sling is greatly increased as the sling angle becomes smaller. Therefore the use of slings requires certain precautions as well as a knowledge of safe working loads permissible. For best results, sling angles should never be more than 90-degrees, and rarely less than 45-degrees. Remember to regularly inspect splices and all fittings! Consider using rub strakes if the rope will be in contact with surfaces that may chafe! Multiply breaking strength of rope by number of legs in the sling (1 & 2 in diagram). Therefore, the safe working load is 1413.66 kg! Example: Load of 1000 kgs in a two-leg sling (2:1 purchase) running through a sheave at an angle of 60-degrees. Divide overall load (1000) by number of lines (2) to determine load on each line. Therefore, the theoretical load on the line will be 575 kg! 5/16" Polyester or 1/4" Spectra would do the job in this example. You can use a scientific calculator to determine sine. Simply punch in the angle (as a whole number, eg 40) and press the "sine" function (answer 0.642). Still need a scientific calculator? If you're running Windows, you probably have one! Just go to "Start", "All Programs", "Accessories", then choose "Calculator". The calculator's default setting is "Standard", so if you don't see the SIN/COS/TAN functions, click on "View", then "Scientific".